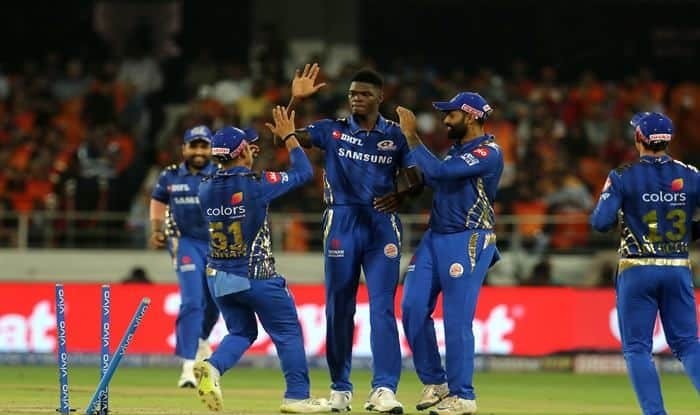 It was the third win for Mumbai Indians in five games while Sunrisers Hyderabad suffered their second loss in five matches. Leggie Rahul Chahar picked up two important wickets to increase the pressure on the home team which was reduced to 62 for five in the 12th over. The hosts needed 53 off the last 30 balls and ended up well short of the target with Joseph running through the opposition line-up. Earlier, it seemed Hyderabad would limit Mumbai to a sub-120 total before Pollard’s brute power came to the fore, enabling the visitors to collect 39 crucial runs off the final 12 balls. Until Pollard cut loose, Hyderabad put up an impressive bowling effort on a slow pitch. It wasn’t the best of starts for Mumbai, who lost captain Rohit Sharma (11) and Suryakumar Yadav (7) early to be 30 for two in six overs. Rohit was dropped in the first over by Siddarth Kaul but could not make much use of that life and was holed out at deep midwicket off Mohammad Nabi in the fourth over. Suryakumar, who had hit a crucial 59 in the previous game against CSK, too did not last long and was adjudged leg before wicket off Sandeep Sharma. Stroke play was proving to be difficult on a slow surface and the situation became worse for the visitors when the in-form opener Quinton de Kock (19) departed after trying to increase the scoring rate. The batsmen especially struggled against Nabi, who ended with envious figures of 13 for one in four overs as Mumbai crawled to 52 for three in 10 overs. After Nabi completed his full quota of overs, his Afghanistan teammate Rashid Khan made life tough for the opposition batsmen. The Hyderabad pacers — Sharma and Kaul — too were up to the task, using their pace well on a slow wicket to stifle the batsmen. Mumbai’s innings hardly had any flow before Pollard provided the much needed final flourish in the death overs by smashing Kaul for three massive sixes in the 19th over that went for 20 runs. Bhuvneshwar’s final over went for 19 runs with Pollard collecting two fours and a six, giving Mumbai something to bowl at. Poor fielding let Hyderabad down towards the end of the innings.